The seven-level retail component of the 2.8 million sf Time Warner Center, collectively known as The Shops at Columbus Circle, will consist of a retail, restaurant, and entertainment complex totaling 350,000 sf of leasable space. Once completed, the center will feature a mix of over 40 luxury and specialty retailers along with five world-class restaurants and a park view “one-of-a-kind” luxury bar. Major retailers will include Hugo Boss, Joseph Abboud, A/X Armani Exchange, Sephora, Cole Haan, J. Crew, Eileen Fisher, Thomas Pink, Coach, Stuart Weitzman, Tourneau, Whole Foods, Equinox, Tumi, L’Occitane en Provence, Coach, Bose, Borders Books, and Williams-Sonoma. On the second concourse level, The Equinox Health Club and Spa will create a 40,000 sf “club within a club," while Whole Foods will occupy 60,000 sf on concourse level one. Other retailers: high-end eyewear retailer Morgenthal Frederics; European-based retailer 4You will move into 9,581 square feet next to J. Crew on the second level; menswear shop Thomas Pink; Crabtree &amp; Evelyn; Eileen Fisher; Stuart Weitzman fashion boutique. The Shops at Columbus Circle on 19 January 2004. I have an agent at Whole Foods. I believe Whole Foods is opening on February 4th, the shelves are already getting stocked with merchandise, other stores too might open the same time. AT slightly less than 60,000 square feet, the Whole Foods supermarket opening on Feb. 5 in the new Time Warner Center will be the largest supermarket in Manhattan. It will take up most of the space on the first lower-level concourse of the complex, reached by escalators just inside the main entrance on Columbus Circle. The chain, which has 146 stores across the country, including one in Chelsea, specializes in organic products and meat and poultry raised without hormones or other additives. The usual aisles of groceries, fresh produce, dairy, baked goods, butcher counters and seafood will share the market with about 200 running feet of prepared foods — about the length of a city block. Among the choices will be a sushi bar with a few seats and sushi to go, a brick-oven pizza counter, two cold-food salad bars and a soup station. Hot-food bars will serve Indian, Latin and Pan-Asian food prepared to order and freshly roasted meats like leg of lamb with side dishes like macaroni and cheese and scalloped potatoes. At a chocolate counter, the strawberries or cookies you buy can be dipped while you wait. And you can finish everything off with freshly roasted beans at the coffee counter. There will be a cafe with 248 seats. A large display of fresh flowers will greet shoppers at the entrance. A shop for personal products like lotions, called Whole Body, is off to one side. Whole Foods hopes to install an enclosed wine shop in part of the space, pending approval from the State Liquor Authority. There will be 40 checkout counters. The market will be open from 8 a.m. to 10 p.m. daily. Delivery will be available, but orders will not be taken by telephone. The parking garage at the rear of the complex will have direct access to the store. Famous Chefs! Sumptuous Food! Luxuriant Settings! TWO weeks and counting. On Feb. 4, some 100,000 square feet of marble floors will shine behind a facade of 90,000 square feet of glass, and more than 3,000 guests in formal attire will enter the soaring atrium of the Time Warner Center at Columbus Circle to celebrate its opening and the arrival of widely anticipated new restaurants on two floors. They will have a chance to look out over Columbus Circle and Central Park from Per Se, Thomas Keller's $12 million restaurant on the fourth floor, where they may sample Mr. Keller's foie gras au torchon and even have a chance to wander through his custom kitchen. They might have a bite of grilled beef in the gilt and scarlet dazzle of Jean-Georges Vongerichten's as-yet-unnamed steakhouse. And some may be tempted by a piece of sushi at Masa or Bar Masa, two new incarnations of Masa Takayama's breathtakingly expensive Ginza Sushiko in Los Angeles, which the chef closed in order to relocate to the center. The party will continue on the third floor, with tidbits like a tiny lemon curd tartlet prepared by Gray Kunz and served near the entrance to his unfinished restaurant, Café Gray. The restaurant across the way, to be run by the Chicago chef Charlie Trotter, will not open for months, but his employees may be serving oysters, too. Good stuff. But when can common citizens get reservations, or at least set up their speed dials to try? The answer is: soon. (And for those restaurants that already have reservation lines, phone numbers follow.) On Feb. 5, though, the day after the opening, dining on the restaurant floors at the Time Warner Center will be extremely limited, just appetizers at Rande Gerber's Stone Rose, a bar and lounge on the building's fourth level. There will be takeout food available from the Whole Foods Market on the lower level, where more than a dozen different food "stations" will offer dishes like sushi, pizza, soups, roast pork, macaroni and cheese, and Asian stir-fries, all made in the market's own kitchens. Another choice is Asiate, the serene restaurant on the 35th floor of the Mandarin Oriental hotel in the north tower, a part of the complex which has been open since December. But the star chefs are barely beginning to light their ovens. The restaurants, named the Restaurant Collection by Kenneth A. Himmel, the president of Related Urban Development and the project's quarterback, will begin to open their doors to the public in mid-February. All the pieces of the Restaurant Collection will not be in place until the fall, when Mr. Trotter's seafood restaurant and oyster bar is expected to open on the third level. Nonetheless, even without dinner, crowds are expected during the early weeks. When the first of the estimated 18 million annual visitors to this $1.7 billion complex step inside the main doors they will be in a vast glass and marble concourse four stories high, like an amphitheater facing Columbus Circle and the park. Real estate developers might consider it to be an unconscionably frivolous waste of potentially rentable space, but Mr. Himmel calls it Time Warner's gift to the public. Aside from the restaurants, it is the distinguishing feature of the complex. There are stores all around, among them Coach, Tourneau and Williams-Sonoma. Escalators sweep up to the second floor, where the rest of more than 40 stores are located, then on to the third level, where the dining options begin. Though Mr. Himmel bristles when anyone refers to the restaurants as being in a "mall," their location, above the ground floor, is what many observers of the New York restaurant scene consider to be their greatest drawback. There will be another entrance on the 60th Street corner of the building, with a marquee for the Restaurant Collection, a doorman, and elevators that take eaters, not shoppers, directly to the restaurant floors and to Jazz at Lincoln Center, which takes up the fifth to seventh floors and will also have a cafe run by Great Performances, a catering company that provides food for a number of public places. Guests at the Mandarin Oriental, residents of the condominiums in both towers, and people with offices at Time Warner and other companies in the complex will have elevators that arrive on the third floor. From there, special escalators continue to the illustrious fourth-floor dining rooms. In addition to Yabu Pushelberg, the designers of the restaurants are as impressive as the chefs. Adam Tihany, David Rockwell and Jacques Garcia have all emphasized warm woods, rough-hewn stone, leather, gold, velvet and other luxurious materials to contrast with the hard-edge glass, steel and gray marble of the building. For the restaurants and their retail neighbors, which will offer a range of prices and cuisines, this is what you will need to know. STONE ROSE, a bar and lounge that will seat 300, with the capacity for 100 in a private room, will open on Feb. 5. Light food prepared by Jean-George Vongerichten's kitchen next door will be available. Reservations will be accepted beginning Feb. 5 at (212) 823-9796. PER SE, on the fourth level, is opposite Stone Rose, across the atrium. After a series of tasting dinners and parties, it plans to open to the public on Feb. 16. Thomas Keller, the chef and an owner, will remain in New York during the first few months. His French Laundry in Yountville, Calif., is closed for renovations, at least until spring. Per Se, designed by Adam Tihany with elements that echo French Laundry, like a blue door and a wood-burning fireplace, has a spacious lounge area and bar. The terraced dining room, in neutral tones with matched panels of Australian walnut and polished taupe marble from the Southwest that Mr. Tihany said is called "wildhorse swirl," has generous views on several levels. There are 74 seats in the dining room, a private room with 10 seats, and two other, more formal, interior private dining rooms that can seat up to 60. It is the largest of the restaurants at 13,412 square feet, and has an enormous kitchen, but it has one of the smaller dining rooms. Though Mr. Keller plans to be in New York while the French Laundry is closed, and will be visiting regularly after that, the chef de cuisine in charge of the restaurant is Jonathan Benno, a graduate of the Culinary Institute of America who has worked at Gramercy Tavern and Craft. The restaurant will have prix fixe tasting menus at $125, $135 and $150. It will be open for lunch on Friday, Saturday and Sunday, and for dinner nightly. Starting Feb. 2, reservations will be accepted at (212) 823-9335. MASA and BAR MASA, which are both expected to open in mid-February, are the smallest restaurants in the complex. Their entrances are sea-foam frosted glass, and the rooms have walls covered with blocks of mottled Japanese Oya stone that Masa Takayama, the chef and owner, selected. Bar Masa will have a sushi bar with 13 seats and a lounge area that will accommodate 26. Masa has 26 seats in the dining room, including two areas that can be closed off for private dining, plus 10 at the sushi bar. It will offer multicourse tasting menus at lunch and dinner ranging in price from $300 to $500. Reservations will be accepted after Feb. 15 at (212) 823-9800. JEAN-GEORGE VONGERICHTEN'S STEAKHOUSE, as yet unnamed, is expected to open by early March on the fourth floor's 60th Street side. The food is based on Mr. Vongerichten's elegant Prime in the Bellagio hotel in Las Vegas, a steakhouse that tilts toward France, with an array of sauces and side dishes. Here, the design, by Jacques Garcia, who did Danube for David Bouley, is pure fantasy, a "Midsummer Night's Dream." It has red walls, trellised borders and gilded trees with leaves and branches that graze the ceiling and are hung with fanciful crystal chandeliers. The design is meant to evoke nearby Central Park. The restaurant will seat 120, and will have a private room to accommodate up to 40 people. The menu for lunch and dinner will be à la carte. Reservations will not be accepted until March. CAFÉ GRAY, on the third level, designed by David Rockwell, will be a brasserie-style restaurant with an open kitchen facing the park. It is also to open in March. It will have 120 seats, with another 80 in a private room and 35 at the bar, making it the restaurant with the biggest capacity. Gray Kunz describes the food he is planning as "personal," with the subtle Asian touches for which he is known, and some classics, like the braised short ribs and mushroom fricassee he did at Lespinasse. Mr. Rockwell's plans call for etched glass, embroidered leather and lots of chocolate brown with brasserie references. Armoires will display artfully arranged collections of ingredients and there will be an herb garden in the kitchen. The restaurant will serve breakfast, lunch and dinner daily with à la carte menus. Mr. Kunz estimated the average cost of lunch at $35 or $40 and dinner at $50 to $75, not including beverages. Inquiries about reservations are being accepted at (212) 823-6338. CHARLIE TROTTER'S SEAFOOD RESTAURANT, on the third level, will be informal, with an oyster bar. It will not open before fall. No name or designer has been selected and there is as yet no phone number for reservations. BOUCHON BAKERY, also on the third level, will be a retail bakery and pastry and chocolate shop run by Thomas Keller. It is to open in mid-March. All the baking will be done in the kitchens at Per Se. There will be cafe tables with 24 seats for breakfast, light lunches of soups and panini, tea and supper; reservations will not be accepted. It will be open from 7 a.m. to 7 p.m. daily. And ASIATE, the restaurant on the 35th floor in the second tower, off the lobby of the Mandarin Oriental hotel, is open for lunch and dinner daily. It has 86 seats and serves Asian-accented food by its chef, Noriyuki Sugie. At lunch there is an à la carte menu and prix fixe with two courses for $25, three for $35. The prix fixe dinner is $65 a person. For reservations up to one month in advance, the number is (212) 805-8881. 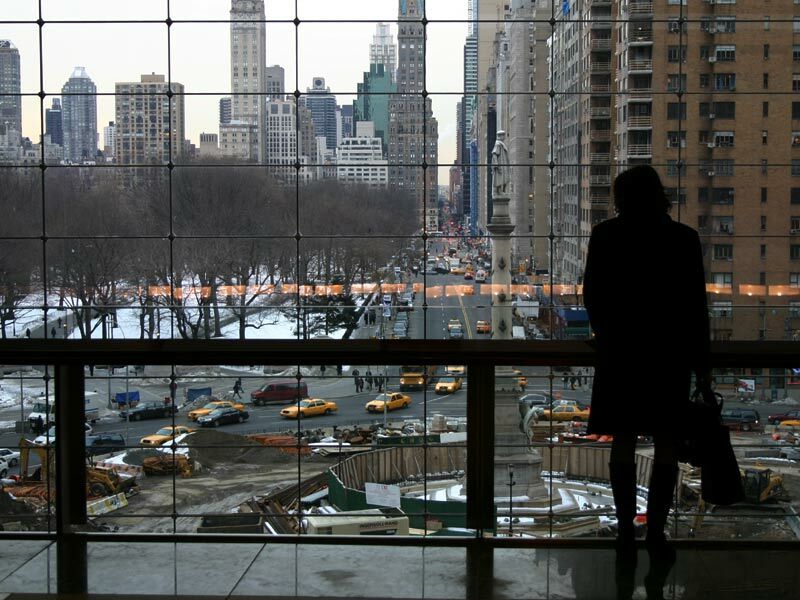 Time Warner Center, which will open to the public on Thursday, includes a four-story atrium with a view of Central Park and the skyscrapers on Fifth Avenue. But will they go up? Only the customers themselves can answer this crucial retailing question: whether shoppers will ascend the Time Warner Center's four-story atrium, bursting with shops large and small, when it makes its public debut tomorrow. More than 80 percent of the center's retail outlets will be open when they are unveiled to invited guests this evening. Most of the building's much-anticipated new high-end restaurants, presided over by celebrity chefs like Thomas Keller, Gray Kunz, Charlie Trotter and Jean-Georges Vongerichten, will open in the coming weeks and months. Ultimately there will be 40 stores and 10 restaurants and bars at the $1.7 billion Time Warner office, hotel, entertainment, dining, condominium and shopping development at 10 Columbus Circle. But New York's fickle, street-loving pedestrians will have to brave two obstacles that have vexed many of the city's would-be vertical retailers: escalators and elevators. The center's developers - the Related Companies and Apollo Real Estate Advisors - insist that the retailing mix in the multi-use building will be irresistible. But "vertical retailing hasn't worked very well in New York," said Alan Victor, an executive vice president of Lansco, a brokerage firm that specializes in retailing properties. Luxury shopping never had a chance at the Herald Center, on 34th Street at Herald Square. And Trump Plaza on Fifth Avenue, once synonymous with glamour, "had success initially as a specialty center, but lost its luster," Mr. Victor said. 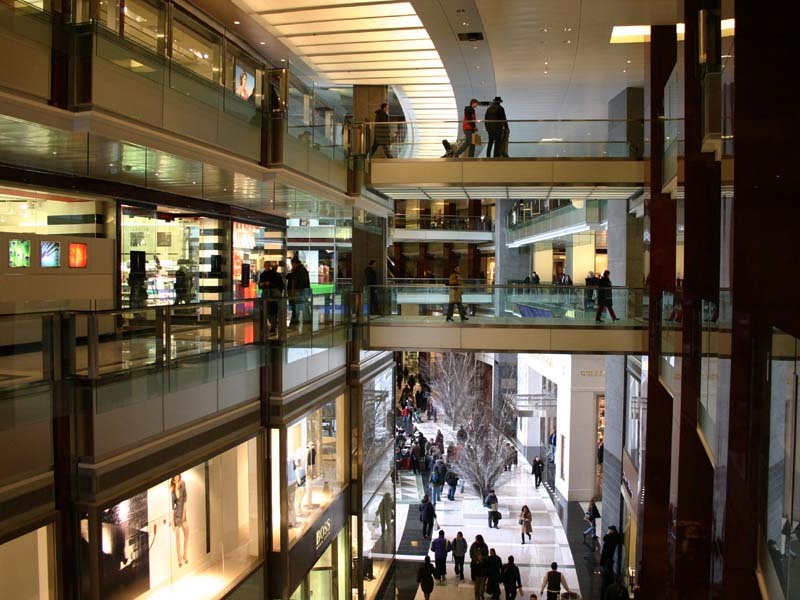 Should customers deign to ascend in the four-story, glass, steel and stone Time Warner atrium, however, they will be enveloped by a 500,000-square-foot people-moving engine calibrated to deliver visitors and their credit cards, to a wealth of shoppertunities. The complex is home to the new 865,000-square-foot world headquarters of Time Warner; a 251-room, five-star Mandarin Oriental hotel; 191 luxury residential condominiums up to the 80th floor; 200,000 square feet of additional office space; a 504-car parking garage; and the 150,000-square-foot Jazz at Lincoln Center with its three main performance spaces. Then there are the Shops at Columbus Circle, as the retail stores are grandly branded, with 350,000 square feet of space that is more than 90 percent rented. Its developers are touchy when their new assemblage is likened to an urban mall. "The mall is a suburban paradigm," said Kenneth A. Himmel, president of Related Urban Development, the managing partner of the center's retailing component. "A mall is antiseptic, it has no architectural stamina and it's not culture-based. This is a different animal." Then what is it? "This is an urban retail entertainment department store," Mr. Himmel said, "with great chefs." Crucial to the center's grand design is the east-facing atrium at Columbus Circle, which has sacrificed 50,000 square feet of potential rental space to a soaring hall - modestly anointed "the Great Room" - with a curving, two-block-long gallery that affords views of the exterior streetscape and Columbus Circle. "You will always be oriented to the street," Mr. Himmel said, "while visually, your eye will constantly be caught by people walking in the galleries, and moving through the stores." He disparaged other vertical urban retail locations "where you're enclosed by four walls, and feel like you could be anywhere in the world," he said. The sense of vista and orientation is enhanced, Mr. Himmel said, by the curving, indoor, passageway paralleling Broadway that he termed "a great gallery like those in London, Paris and Milan." The 57-year-old Mr. Himmel assembled similar mixed-use developments at Water Tower Place in Chicago and Copley Place in Boston. "The view here will be like a magnet," he said on a recent afternoon, standing on the fourth level and pointing to Columbus Circle and the Fifth Avenue massif across a snow-covered Central Park. He added that the 3.4-acre site, at the juncture of Central Park and Midtown, is within walking distance of 35 million square feet of office buildings and is "the gateway to the Upper West Side," where there are some 265,000 potential shoppers. A somewhat smaller contingent from the Upper East Side is also expected to visit. 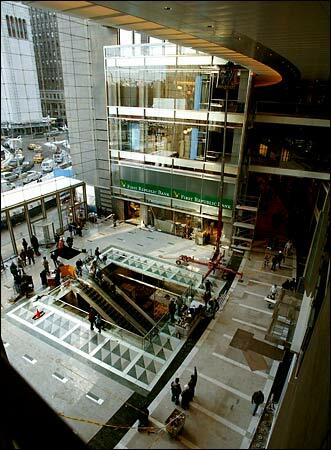 Though there is not an obligatory Gap or Banana Republic, the atrium will contain Manhattan's ninth Sephora, its sixth J. Crew and its fourth Williams-Sonoma. But there are some new offerings, including the first free-standing Joseph Abboud fashion store - a flagship - and the first satellite of J. W. Cooper, a Miami-based luxury accessory retailer of buckles, belts and boots with prices ranging from $75 key chains to $20,000 gem-encrusted buckles. "I think this customer mix will be a perfect fit for my store," said Todd Rauchwerger, the store's owner, who signed a 10-year, ground-floor lease. But the center is hardly a playpen of super-high-end salons. "I can't upstage Fifth and Madison," Mr. Himmel said, pointing out toward the gold coast of the city's most exclusive retailers. "But our restaurants and our jazz can be world class. What we have here is a collection of worldwide destination restaurants, each of them hand-crafted - along with a broad spectrum of shopping choices." Skeptics say that there is more than enough retail duplication in the metropolitan area, and visitors to the center are more likely to shop the Sephoras in their own neighborhoods. "No great retail space has shops that are 100 percent unique," countered Stephen M. Ross, chairman of the Related Companies. "And retailers know not to establish a store in a new location if it will cannibalize their sales." That said, "moving people up in a development like this is the biggest challenge," Mr. Himmel acknowledged. And so, as visitors cruise the atrium corridors of brushed stainless steel, burled mahogany and book-matched rosewood paneling, they may not be aware of their role as charged particles attracted by powerful forces in a large-scale controlled retailing environment. The two escalators leading up into the space have been aligned with the two east-west sidewalks on Central Park South, "as a subliminal invitation to come in and move up," Mr. Himmel said, using the u-word again. Escalators will deposit visitors just where the developers want them: facing stores on lower floors, and facing Columbus Circle on the high-end restaurant level, the fourth floor. 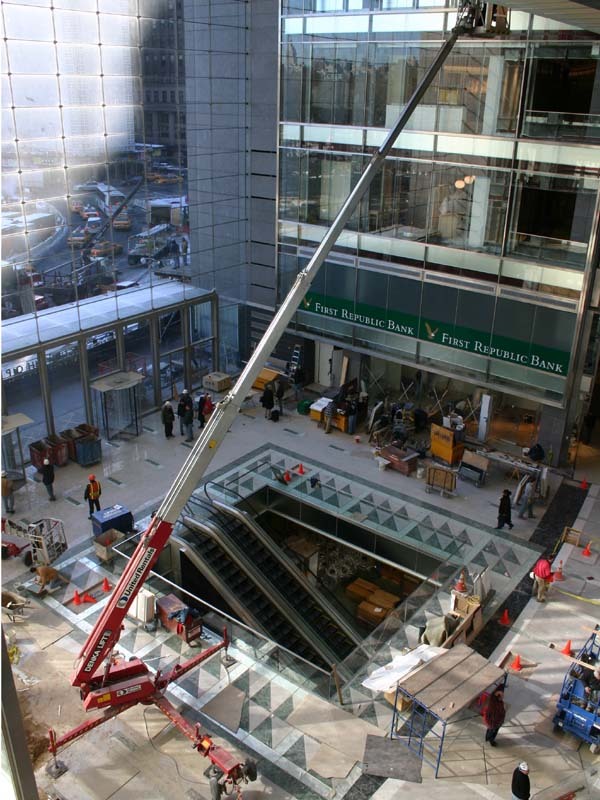 From the second level, two escalators will deliver customers to the front door of new restaurants presided over by Mr. Kunz and Mr. Trotter. Jazz and restaurant customers, and those bound for the below-ground Equinox Fitness Club, can be whisked directly to their destinations by special elevator banks. "We feel that the restaurants will drive people to the upper floors," Mr. Ross said. Also driving traffic, he added, will be the condominium units, 70 percent of which have been sold. A studio tour of the new CNN television facility and its gift shop could continually replenish the upper levels with visitors, Mr. Himmel said. And Jazz at Lincoln Center on the fifth floor is expected to drive evening-hours traffic and deliver patrons to stores and restaurants before and after performances. Rents are said to range from $350 per square foot on the ground floor to $65 per square foot up top. But several retailers said that the developers had offered incentives such as free rent and construction financing to lure sought-after tenants. Mr. Himmel commented that although a few retailers had been given free rent to compensate for an opening that was delayed from last fall - and though several favored tenants were given concessions matching their construction cost - "90 percent of the space is on guaranteed rents," he said. To its developers, the building itself "is an event," Mr. Ross said. But this raises the possibility that New York's been-there, done-that consumers will visit once, never to return. The designers say they have anticipated this reaction by providing retailers that will regularly attract office workers, neighborhood residents and other repeat visitors, principally the 59,000-square-foot Whole Foods Market, which is to be Manhattan's largest supermarket. 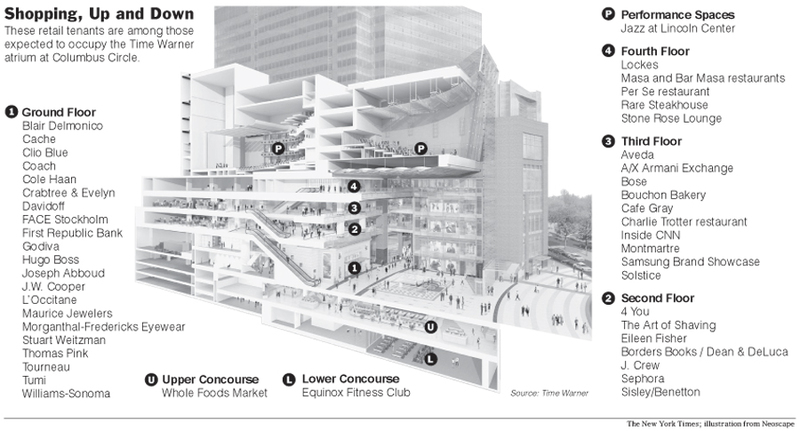 Furthermore, the Equinox club "will build repetitive visits," Mr. Himmel said, as will a 30,000-square-foot Borders store. 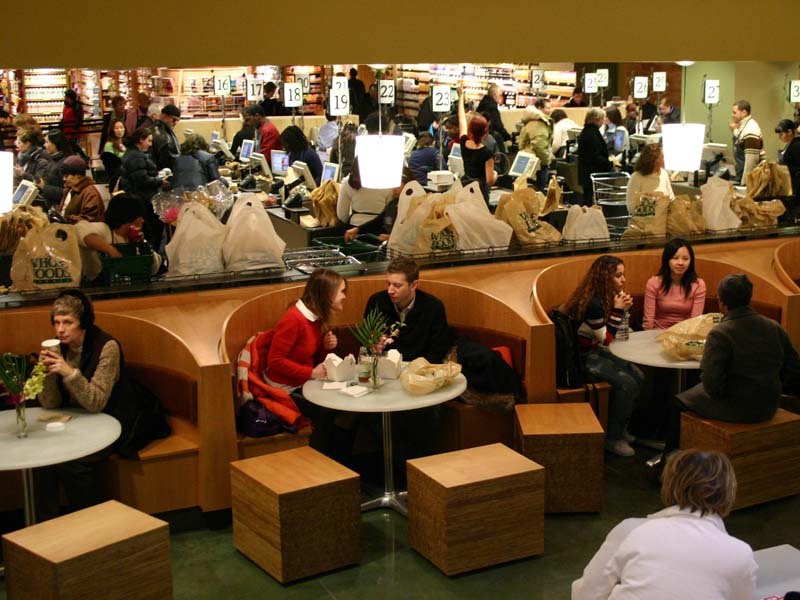 Mr. Himmel notwithstanding, naysayers question whether large numbers of restaurant customers, Whole Foods shoppers, gymgoers or jazz patrons will have much inclination to do retail shopping - and vice-versa. These skeptics also say that Columbus Circle itself - and its raging traffic and pedestrian-unfriendly street crossings - could pose a scary transportation barrier to office workers, tourists and potential shoppers from the East Side. Mr. Himmel acknowledged that pedestrian barriers were originally a concern of the developers, but said that a $30 million renovation of Columbus Circle, to be completed next fall, would provide new landscaping, paving and widened pedestrian corridors "to provide better access from the east," he said. This refurbishment will also include a tweaking of the Columbus Circle fountains "by the same people who did the fountains at the Bellagio," Mr. Himmel said of the Las Vegas hotel that helped inspire the atrium. "Inside and out, this place will be great for New York." 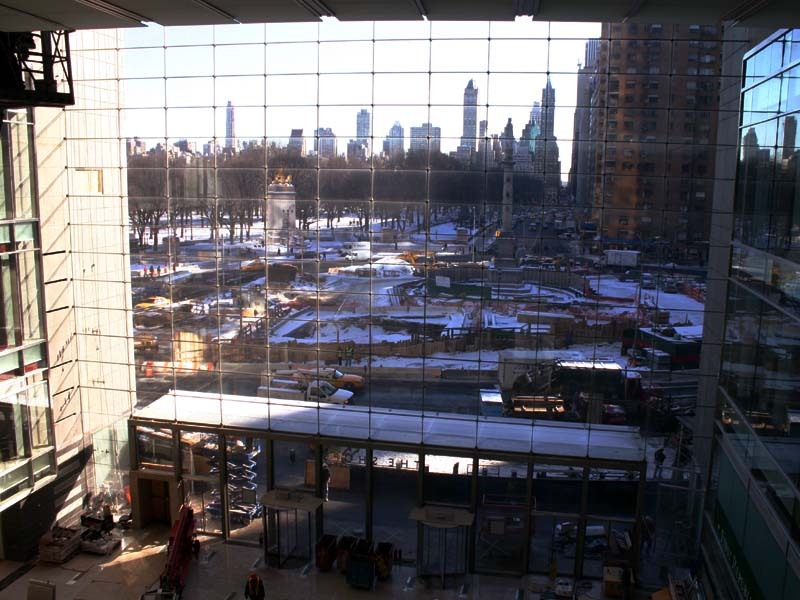 The view of Columbus Circle and the statue of Columbus from The Shops at Columbus Circle on 5 February 2004. The gallery of The Shops at Columbus Circle. The Whole Foods store at The Shops at Columbus Circle. 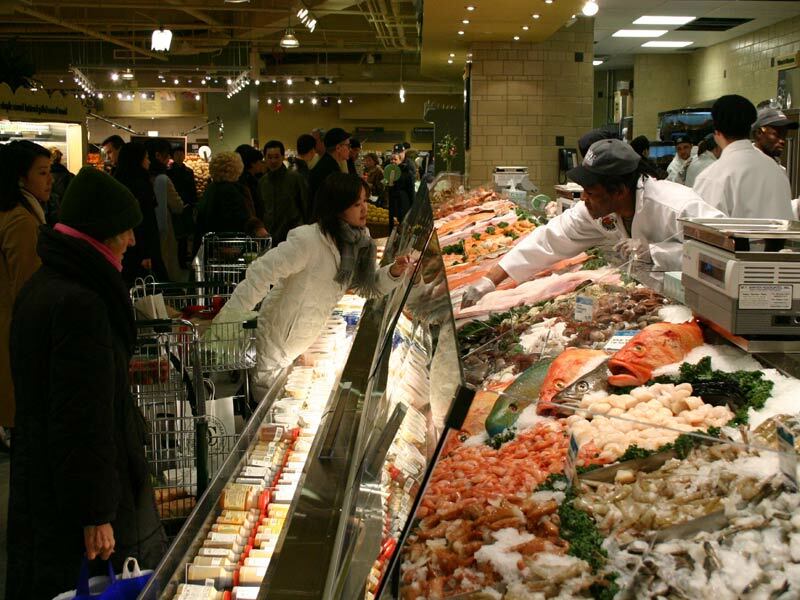 The fish department in the Whole Foods. Am I wrong, or is there no subway access on the lower level? If true, it's absolutely scandalous. The subway entrance is on the first floor (floor 0 for any Europeans and Australians on the forum). I haven't heard about access from the lower levels. My girlfriend loves their products, I usualy get them for her at Sephora. I told her about the new store, she can't wait to go there next weekend. The Whole foods store kind of looks like Wegmans, only smaller. "The subway entrance is on the first floor (floor 0 for any Europeans and Australians on the forum)."